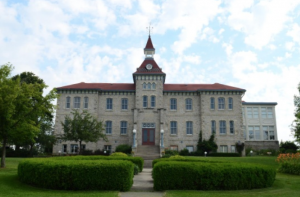 Standing tall at the top of the hill is the Wellington County Museum and Archives. The photos at right show the museum section (left) while the other shows the archives section at the back (right). 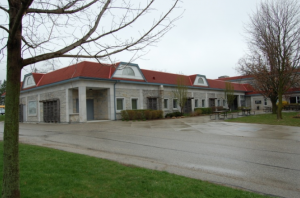 The Wellington County Museum & Archives is the designated repository for the municipal records generated by the County of Wellington, as well as all of the original and current member municipalities within the county excluding the City of Guelph. These records include council minutes, bylaws, tax assessment and collectors rolls, voters lists, etc. The Archives also collects donations from individuals and organizations. The archival records include photographs, family histories, maps, diaries, minutes, newspapers, etc. An online catalogue provides access to the holdings. Several collections have been digitized including the Women’s Institute Tweedsmuir Histories, Wellington County Historical Society essays and journals, as well as Wellington County local history newspaper articles. 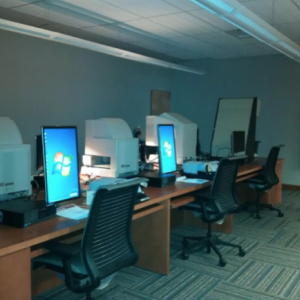 If the reading room pictured on the left and the microfilm room pictured on the right don’t make your researching a pleasant experience, the staff is sure to do so. 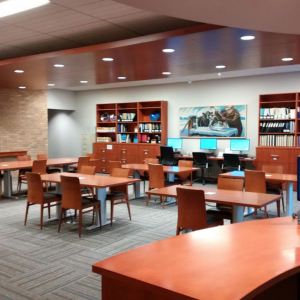 The Archives are open seven days a week – no appointment is necessary.